First, the no booking thing. I really don’t get it. Your own table, your own companions, a choice of food and an assigned time to eat are the very fundamentals of a restaurant. They have been since the very first restaurants in post-revolutionary Paris. Now, I would not, had this been my choice, chosen a wildly popular (at time of writing, who knows tomorrow?) restaurant on a Saturday night. But it was my daughter’s birthday dinner and her choice. We arrive at 6.30 to be told a table will not be available for an hour and a half. An hour and a half. She really, really wants to go to this restaurant so we walk to a nearby wine bar. I am accused of being old and grumpy. As charged but I quell my grumpiness. As it happened, we only waited 45 minutes. Only. Once inside this tiny, packed, dark, noisy room – the lack of soft furnishings exacerbated by the volume of the music – we are shown a table for two which is tiny even for a table for two. And we will be four when the boyfriend arrives. All tables but one in the front are the same size. They knew we’d be four. With wine and water I’m not sure where the food is going to go. It’s too dark to read the wine list, and almost too noisy to hear the suggestions. Then I remember the light on my iPhone. Very useful. Soon everybody’s using theirs. It is, of course a share plate deal. And some of the best plated we shared were a wonderfully soft, creamy and deeply flavoursome smoked eel with leek and a burnt oil crespelle ­­­– the menu said crespelle I’m not sure it was there but who cares? Best eel I’ve ever tasted. A large, crisp on the outside and beautifully crumbed on the inside pretzel came with whipped bottarga; and I could have eaten a hug bowl of the rich and beautifully cooked lamb ragu with pappardelle had it been offered. There was more, and it was good. As was the service. The dishes came staggered to the size of the table. The wine – the first Patrick Sullivan Haggis rose chosen by birthday daughter was terrific, the second a French cabernet franc chilled especially for us also very fine but I didn’t get the name. Ultimately we enjoyed the food the wine the company and the service. But having reviewed restaurants in Sydney for over 20 years, I’ve seen fads in décor come and go. Nothing pleased me more in its departure than the last period of noisy restaurants and the re-introduction of carpets. But you don’t need carpets. A thick hunk of foam stuck to the underside of the tables helps a lot. I’m old. But does anybody of any age really enjoy tiny knee-hugging tables, runway level noise and having to wait 45 minutes for the pleasure? It’s called hospitality. Be hospitable. Let me book. Let me hear conversation. Let me see the menus. And give me a little room. Not too much to ask. If there is a better smallgoods butcher than Pino Tomini Foresti of Pino’s Dolce Vita in Sydney or indeed Australia, then I’d like to know who it is. I’ve had the privilege of watching Pino work many times, the last an offal demonstration which I stupidly didn’t record either properly in words or with images. But watching this superb craftsman extract, identify, clean and cook all the bits we forget to eat was eye-opening – and palate challenging. I bravely ate a testicle schnitzel only to find that I loved it. Sweet, nutty (hah) like sweetbreads. But try putting it on a menu. 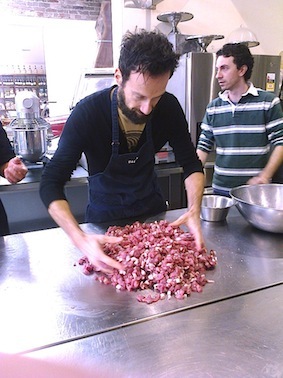 Anyway on a recent Sunday I was invited to watch Pino and a bunch of chefs from my friend Stefano Manfredi’s restaurant Balla learn how to make salami, Pino’s way. We stood around the large stainless steel bench in the kitchen behind the butcher shop. There was head chef Gabriele, Roberto, Francesco, Bobby, a young Chinese chef who was brought up in Bologna, a Greek Australian boy whose name I didn’t get but who I called El Greco, Judy (I think) a Malaysian pastry chef, another whose name I didn’t get. Helping were Pino’s wife Pia, his two sons Marco and Fabiano and Massimiliano, the son of a butcher friend of Pino’s from Garda. The first thing he did was to show us what he called a salame nobile which is produced all over Italy and incorporates meat from many muscles of the pig. 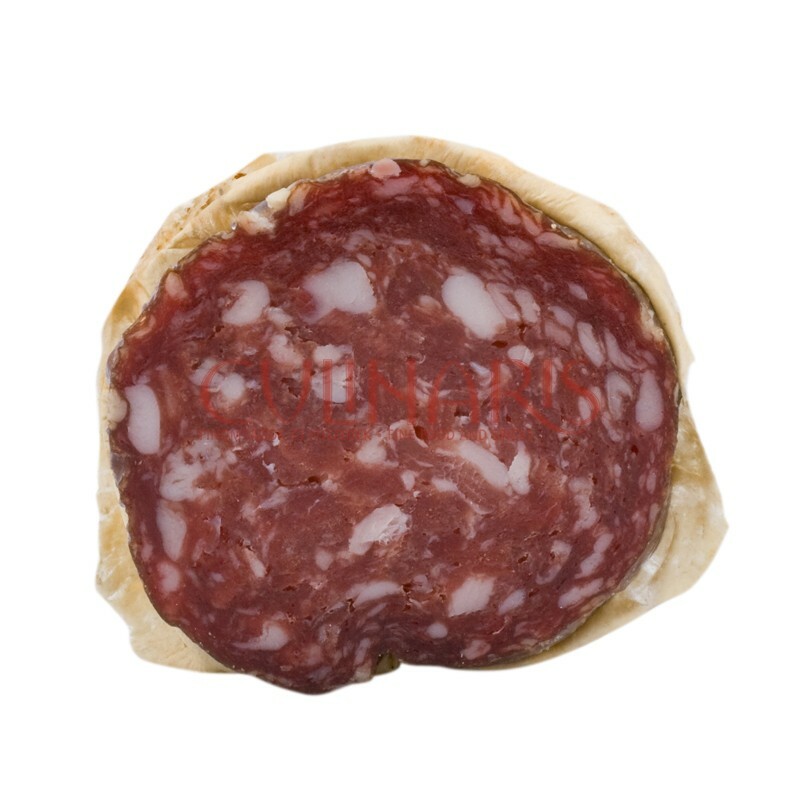 Most important is that the meat comes from a large pig, around 130kg dressed, 160kg live.It had what Manfredi called a ‘lovely perfume’, sweet fat, a mild and what I would call a quintessential salame flavour: meaty and savoury. While we were tasting it, Pino told us that in Calabria, salami are served with seasonal fruit. As Pino cut away the pancetta he also showed us the different kinds of fat, only some of which, the firmest, around 14-22mls thick, is good for adding to the salami. This is a matter of experience. We felt some fat which was too stringy, others too dry. For example, the middle fat from the loin is used, but not the inner and outer layers. Traditional ­– and traditionally – ­ Salami are best and most safely made in winter, and in Australia that has been from the Queen’s birthday weekend (June in all of Australia but for WA) until August. We were just a little outside that safety zone, but it was a cool day. In Italy, he told us, while all were working, there are many regional ways to butcher a pig. “Here, there is only one way.” So Pino only buys carcasses so he can butcher his way for the cuts he wants. Pino holds up one of the thin strips of pork before it is cut into little cubes, and tells us this is used to make coppiete which is marinated in white wine and garlic for up to three weeks and dried in the oven: sort of an Italian jerky. 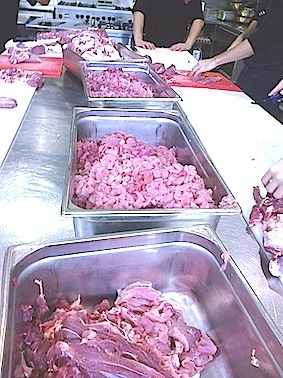 Now all the meat has been cut and cubed, the fat is being chopped into similar size pieces. The salami will be 30 per cent fat. 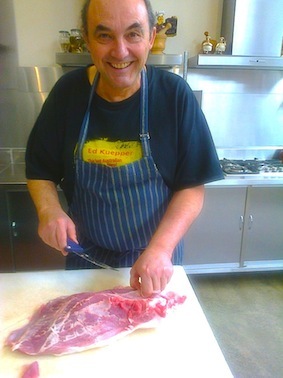 Pino is de-boning the ribs to take out the fat. Now a saucepan of wine and rosemary is put on the flame, and a blow torch burns off the alcohol. This is then cooled and will be added to the pork and pork fat mix. For 5kgs of meat, threw will be 1.5kg of fat. He measures the fat on the scales to the last 10gms. Precision is important Now, having weighed it equally meticulously, he turns the meat onto the bench. Pino now pours the wine, rosemary and cloves into the fat and mixes it through with his hands. This helps to distribute the fat throughout the meat. He now adds the fat to the meat. There follows a long period of kneading, in order to firstly mix the meat and fat evenly, and secondly to build up the stickiness of the mixture by bringing out the protein so that it holds together in the casing. Now part of the salt is added ­ 16gms per kg for flavour (and 4gms of pepper per kg) then, jut before filling in the casing, after it has sat at 18/22 degrees overnight, another 12gms per kg to preserve. We are all invited to come and knead and smell the mixture after carefully washing our hands. We do. It is deeply satisfying and smells wonderful, winey, porky and salami like. And now, with the salami ready for filling tomorrow, we go to lunch. 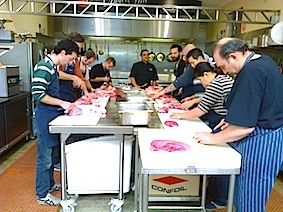 The Balla chefs have prepared a veal head ragu, a beef ragu, a lasagne and a big pan of polenta. And Pino supplies bottles of red wine. Salud! Watching the agonising, painstaking, time-consuming repetition of this work reminds me once again of the lack of reality in understanding the work of a chef, the sheer hard work that is behind every dish that appears on the table, and that is missing from the mindless celebrity chef worship. And when you buy a real, traditionally and artisanally made fair dinkum salami, pick up a slice, inhale it’s ‘lovely perfume’ deeply then chew slowly, savouring every bit. In honour of those who made it and the time it took them. When was the last time you had a truly awful meal? I don’t just mean forgettable, I mean sensationally, spectacularly crook. Some time ago it occurred to me that since I began my career as a food writer I have become so jaded, so critical, so judgemental about the food served to me that a horrendous meal is far more thrilling than just another masterpiece. So I want to talk about bad meals. They can be divided into three categories: Domestic Disasters, Professional Calamities and Foreign Fiascos. Let’s cook off with an entry in the Domestic Disasters category. The woman who was to become my wife and I had just set up house together. It was to be our first dinner party. I had elected to cook a strange dish from the 1970 edition of Elizabeth David’s Italian Food, Cephalonian Hare, Lepre di Cephalonia. I’d first cooked this dish in Spain. There, I made it in what is known in my part of Spain as a greixonera – a wide-mouthed terracotta dish that sits on the open fire. It was extraordinarily good, in spite of the seemingly incongruous ingredients. 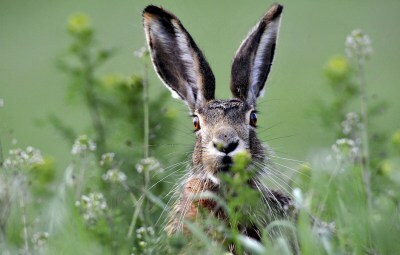 I could find no hare, but rabbits abounded, indeed my next door neighbour bred them, and they were very large. Almost hare-like. Now before the recipe and the disaster, here is a little snippet of information about rabbits, and Spain. Around 3200 years ago, the Phoenicians arrived in what is now known as Spain and decided to stay awhile. One of the novelties they found there was a small, furry, tailless animal with long ears and legs which bred rapidly. It looked like an animal they knew as a hyrax, so they called the new land I-shepan-ha, land of hyraxes. When the Romans arrived they Latinized the name to Hispania, which then became España. Anyway, this particular rabbit, which was originally an Italian rabbit (to add to the countries named after animals list, the first people to arrive on the Italian peninsula were called Italici, from an ancient word meaning ‘land of young cattle’ or ‘land of calves) is marinated in lemon juice, then fried with onions, a dozen cloves of garlic and red wine, among other things. Back in Australia I cooked mine in an aluminium quart pot. Those among you who understand the chemistry of food are already gagging: lemon juice and aluminium. It turned a sort of aluminium oxide grey. When asked to taste it (I wouldn’t), my wife’s comment was “it tastes like excrement” – more or less. We bought in French from around the corner. Our guests were none the wiser. To this day, she need only say the word “rabbit” to stop me crowing about my cooking. Professional Calamities. Where do I start? The raw potato in the yellow Thai curry? No. The deep-fried battered tomato at the Chinese restaurant in Singleton? No. 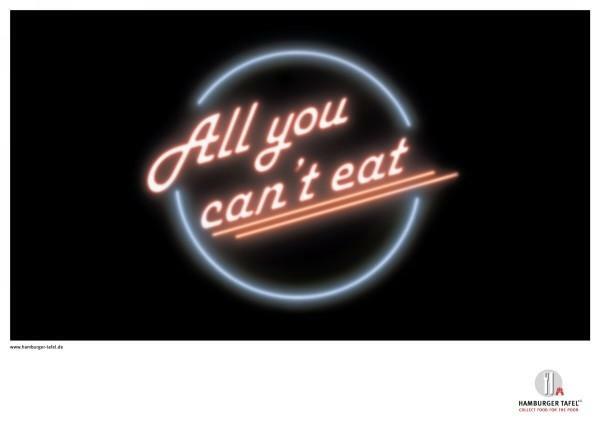 How about the boardroom lunch served in a NSW country town, at the headquarters of a prominent food-processing corporation? The corporation can now be named – Letona – as it is no longer. And no wonder. In a large, rectangular, white crockery serving dish were diagonal strips of crumbled fetta, brined tuna, and tinned peaches. In a lattice-work pattern across the top of this were arranged tinned anchovies. It remained untouched. And finally, a Foreign Fiasco. In Tunis, the very beautiful capital of Tunisia, I had met a charming man who had, it appeared, out of the goodness of his heart – for he asked nothing, and paid his way – taken three days off to show me around. The culmination of this tour was a visit to his village to meet his mother, father and wife, and a lunch (his shout) at the local restaurant, where we were to try the local speciality. We had been communicating in my very bad school-boy French, and I thought I had been doing fine. ‘Maintenant,’ he said with relish, ‘nous mangeons tête d’agneau.’ My heart sank as the French words were translated by my tired brain. Sheep’s head. I had of course heard of the Arabic penchant for eating the head of sheep — but surely this was a dish of the desert Arabs, seated cross legged on sumptuous carpets in their massive tents — surely not my new friend Youssef, in his natty sports coat and grey flannel trousers? Apparently so. I had read somewhere that the eyes are the delicacy and are offered to the guest of honour. We arrived at the restaurant, a simple whitewashed room in a dusty square, the only customers (I found later opened especially at lunch for Youssef, another reason for shame and remorse). I was nervous. Even my rudimentary French deserted me as my mouth dried up. 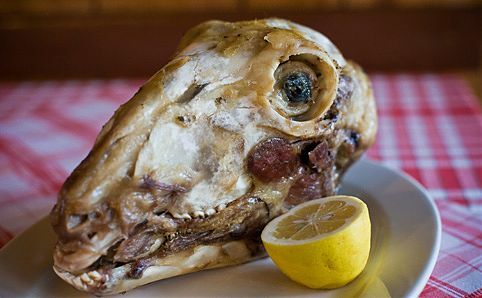 Could I eat a sheep’s head? How would it be cooked? How would he hand me the eyes? As soon as I saw this head, I knew that I would not be able to do it. The chef arrived beaming from the kitchen holding two large plates which, with a flourish, he placed on the table in front of each of us. And there it lay. On my plate. Neatly split in half fore and aft. Inside up. I could see half a tongue, dark grey on the outside, light grey on the inside, and half the muzzle, complete with teeth. In the skull pan, beneath a sprinkling of coriander leaves — as far as I could make out the only seasoning — half a brain, slightly mashed. Youssef grabbed at the tongue, ripped it out and sliced off a chunk, devouring it hungrily. I timidly did the same. It tasted revolting, the texture was worse. It was cold and clammy. The rough grey outer coating was rubbery. But it looked exactly like what is was — a tongue, used by the sheep to lick and swallow. I couldn’t do it. I apologised to Youssef as best I could in stumbling French. He was hurt, it showed in his eyes, but he hid it well, shrugged and ordered me a chicken stew. But I had completely lost my appetite. He ripped off the jaw and got stuck into it, dipping into the brains with a spoon. I could barely look. Afterwards, he took my untouched head home. My distaste was his dog’s good fortune. The curious thing about this gastronomic failure of mine is that I quite happily eat brains, tongue and other organ meats on their own. It was, I am now convinced, the fact that they were still assembled — as parts of the head — that was my downfall. ‘A dish from the ionian Islands, but of Italian origin. Cut up a hare and put it in a deep earthenware pot.Pour over it the juice of half a dozen lemons, add a little salt and pepper. Leave it to marinate for at least 12 hours. When the time comes to cook it cover the bottom of a capacious or heavy pan with about 1/4 inch of fruit olive oil. When it is hot, put in a slice onion. Let it brown slightly, then add the pieces of hare. Brown them on both sides. Add about a dozen cloves of garlic, salt, pepper, a generous amount of origano, and a wineglass-ful of red wine.v (If the hare is being cooked in an earthenware pot heat the wine before pouring it in, or the pan may crack.) Cover the pan and simmer for two and a half or three hours. Classic David. ‘It is not, of course, a refined dish…’ Don’t tell De. I’m going to try it again.